With our time in Alaska already half-spent, we are heading south from Anchorage to the Kenai Peninsula. Although we’ve been told we should, we will not be going all the way to Homer and its tempting Spit. I am disappointed, but philosophical. We just don’t have the time. So we continue to add to the list of reasons to return to The Last Frontier. 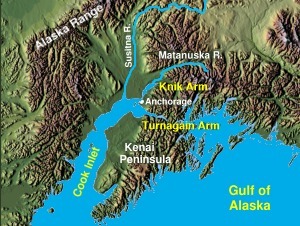 Instead, we will make the 2-1/2 hour drive to Seward today, where we will sightsee and compare charter fishing options. It is prime time for silver salmon. We’ve decided we will avoid “combat fishing” in the rivers in favor of an ocean experience. We’re also glad that we are a week ahead of the annual Silver Salmon Derby, as we have yet to reserve a boat. The Seward Highway south of Anchorage is a National Scenic Byway and and All-American Road for good reason. Travelers between Anchorage and Seward behold incomparable views. We are unprepared for what we see. The route is carved on the coastal edge of steep mountains as we loop around the Turnagain Arm. Turnagain Arm is an appendage fjord off the Cook Inlet known for excellent wild and marine life viewing opportunities. Waterfowl and spawning salmon can be seen at Potters Marsh, so we make a note to return on a free day. I spot a pod of whales between Beluga and Windy Points. Although Dall sheep are known to wander down the mountainside, today only solitary gulls pick their way through the mudflats revealed by low tide. Snow-covered peaks soar above the surface of the waters, with glaciers spilling through their gaps. The Seward highway cuts and climbs through majestic wilderness passes as we make our way toward the Kenai National Wildlife Refuge. The central Kenai is known as Alaska’s Playground to hikers, rafters, canoe and kayak enthusiasts, as well as anglers and hunters. Rushing whitewater gives voice to the landscape and tranquil lakes reflect its grandeur. We have to stop at almost every turn-off even though photographing scenery is not Pete’s thing. Each opportunity is bigger than the last, but we are both so awed that we cannot believe there will ever be another. As we make our way toward the sea again, on an angle toward Seward, we begin to think we might have happily spent our entire time in Alaska here.